Preheat oven to 375°F. Cook pasta as directed; drain well. Lay noodles out in a single layer onto buttered waxed paper to prevent them from sticking together. Spread 1 cup Béchamel sauce over bottom of a buttered 9x13-inch baking dish. Place 4 noo-dles atop sauce. Spread 1 cup Béchamel sauce over noodles. Spoon 1? cups pesto sauce over the Béchamel sauce. Sprinkle ? cup Parmesan cheese over pesto sauce. Repeat layers 2 more times: 4 more noodles, 1 cup Béchamel sauce, 1? cups pesto sauce, and ? cup cheese. Finish assembly with last 4 noodles, 1 cup Béchamel sauce, and ? cup Parmesan cheese. Cover lasagna with foil and bake for 30 minutes. Uncover and bake 20 more minutes. Let sit 10 minutes before serving. Melt butter in a large saucepan over medium heat. Add shallots; sauté 2 minutes. Add flour and whisk until smooth. Reduce heat to low and whisk 1 minute. Gradually whisk in milk. Bring to a boil, whisking constantly. Add bay leaf. Reduce heat and simmer until slightly thick-ened, about 5 minutes. Mix in nutmeg. Season with salt and pepper. Remove bay leaf and let cool. Blend basil, Parmesan, olive oil, pine nuts, and garlic in a food processor until a coarse purée forms. Lightly mix in vegetable broth. Season with salt and pepper. Let cool. 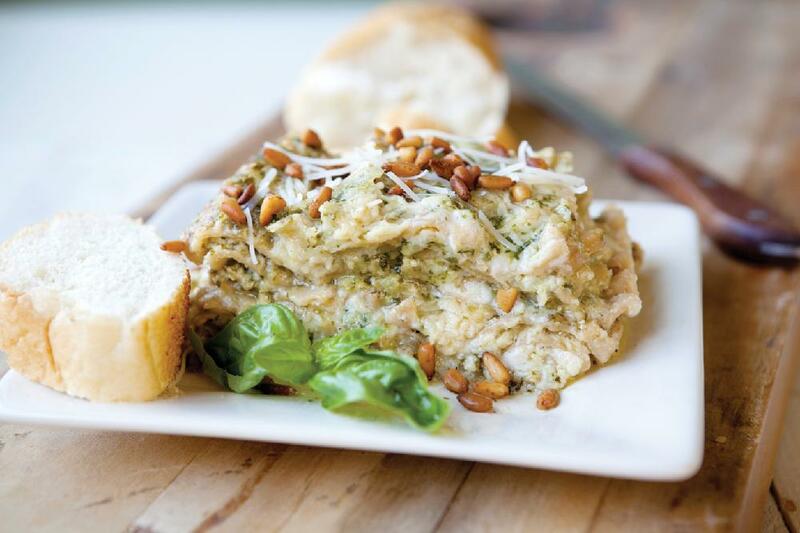 This Fresh Pesto Lasagna recipe is from the The Ultimate Cook'n Cookbook Cookbook. Download this Cookbook today. "I must say this is the best recipe software I have ever owned." "Your DVO cookbook software saves me time and money!" "Call it nutrition software, meal planning software, cooking software, recipe manager, or whatever you want. It is the software I use to stay healthy!" 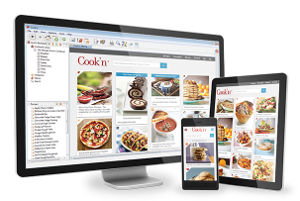 "Your software is the best recipe organizer and menu planner out there!" "Thank you so very much for creating such a wonderful cooking recipe program. I think this is the best recipe program there is!" "I saw lots of recipe software for PC computers but I was having a hard time finding really good mac recipe software. I'm so glad I discovered Cook'n! It's so nice to have all my recipes in a computer recipe organizer. Cook'n has saved me so much time with meal planning and the recipe nutrition calculator is amazing!!! My favorite is the Cook'n Recipe App.